3G/HD/SD-SDI Multiviewer / Quad-Split Mini Converter with 3G/HD/SDI-SDI and HDMI Outputs. 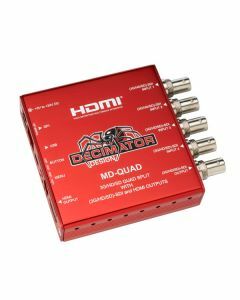 The MD-QUAD from Decimator Design is a low cost, miniature SDI Quad-Splitter with SDI and HDMI Outputs. With four independent SDI inputs, you can now monitor your camera feeds without the hassle of ensuring all inputs are the same SDI standard. The unit comes with a Locking DC Power Supply, HDMI Cable & Mounting Bracket.Â Warranty for all Decimator Design products is 3 years. The first two audio groups individually selectable. AES/EBU, VU, Extended VU, BBC, EBU, DIN and NORDIC Scales. Bar & Float, Bar only or Float only (Float is not available for MQS serials). Separate Bar and Float Ballistics control. Red, Yellow and Green Range adjustment. A single tallies for each input is available from the GPI. Power Supply, HDMI Cable, USB Cable and Mounting Bracket. Input status for all 4 inputs. Output selection of Quad Split or input 1, 2, 3 or 4. Output aspect and type of 16:9 or 4:3 at either 90 or 100% of screen size. Individual aspect format for each input of Same as output, Letter-box or Pillar-box. Quad split mode reference of either Free-run or input 1. USB for control and updates. 1 x 10-bit (3G/HD/SD)-SDI Re-clocked. 4 x Signal lock and rate.